With classes swinging into full gear, students know one thing for sure: they need textbooks. However, textbooks cost money — sometimes a lot of money — and college students don’t always have it in their bank accounts. This leaves some students wondering how often the books they buy will be used or if the bookstore will buy them back when the semester ends. A typical new textbook costs about $100 and some go for more than $200, based on a quick survey of OCCC Bookstore prices. Some question: Who chooses the books? 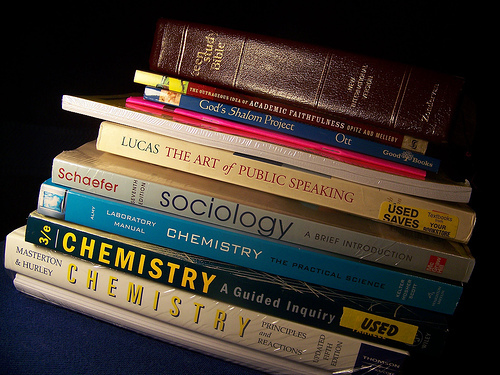 Mathematics Director Tamara Carter said, in most cases, textbooks are chosen by a committee made up of OCCC faculty. She said a group of professors from each department meets solely for the purpose of choosing what books they’ll use for the upcoming semester. Carter said there are three main criteria considered in the decision. First, the committee looks for which book will best cover the material the students need to learn. Then, she said, the group decides which book has the most expansive and helpful electronic package of supplemental learning material. Lastly, they look to see which book is the most affordable for the student. However, some professors elect to go it alone and choose a specific book for their class. Sociology Professor Jerry Ludlow said he has been stepping outside of the faculty-prescribed textbook choice for a few years now. He said his decision was made, in large part, because of the savings he found in going with an older book, which also offered free online supplemental tools. “Of course, I did so with respect to the division office’s choice,” he said. Ludlow said the book he uses covers the same material as the one the committee in his area chose. He said, like Carter, he mainly chooses books based on the quality of the book and what the students will learn from it. However, even when the price is right, students are sometimes left frustrated anyway when a book can’t be sold back after it’s served its purpose. That happens when textbooks are replaced with a new edition or a different book. Emily Nelson, occupational therapy assistant major, said she once bought an expensive textbook only to find she couldn’t sell it back to OCCC’s bookstore because there was a new edition of the book. She said the new version was different from her book by only one page. She was eventually able to sell the book to Textbook Brokers, a private textbook store located at 7445 S May Ave. Textbook Brokers employee Kristie Alkire said, because of supply and demand, they often buy books the college won’t buy. “We have 90 stores [nationally] that provide books for other schools,” Alkire said. Some students question why they aren’t told the book is being discontinued until they go to sell it back. Bookstore Director Brenda Reinke said generally the bookstore staff and even the faculty members teaching courses don’t know at the time students buy the books whether they will be able to sell the books back at the end of the semester. Reinke said sometimes the publishers will tell the bookstore when a new edition is going to be available and sometimes the faculty informs the bookstore employees of a change in the text. Ultimately, she said, the bookstore leaves it up to the faculty to counsel students about buying new or used books — or renting. Typically, Reinke said, the bookstore is updated on the relevancy of a book every 45 days through promotion fliers but other times, there is no news until the beginning of the new semester. Carter said sometimes, when a new edition of a book comes out, publishers will try to change the book as little as possible so that older editions may still be relevant and useful. Carter said choosing textbooks is no hasty decision for the faculty who select them. She said students also will want to ask questions and weigh carefully as to whether they should buy new, or used books, or rent them.